*The museum is inside Tennoji Park. Ten-Shiba’ opened on October 1st, 2015. To get to the museum, pass by Ten-shiba, proceed down the promenade and enter through the Kuroda Han Historical Gate (Kuroda Gate). Take Hanshin Highway’s Matsubara Route southwards to Tennoji Exit and park at Tennoji Park underground parking lot from the road running alongside Tennoji Park. Exit the parking lot through North Exit 1 and proceed to your right (west) along the promenade. Go west on the Tanimachi-suji and Tamatsukuri-suji intersection ‘Tennoji-ekimae’ and park at Tennoji Park underground parking lot from the road running alongside Tennoji Park. 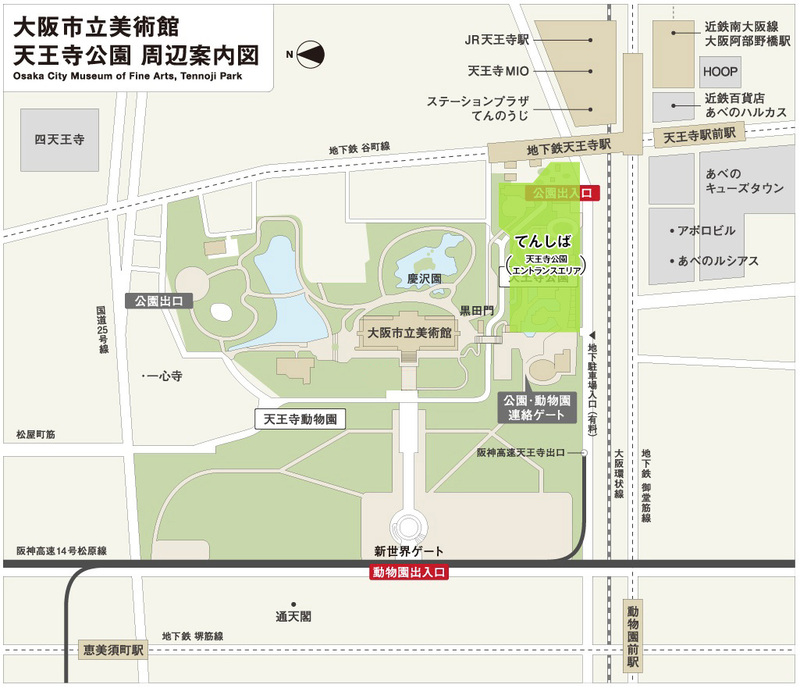 As the museum does not have its own parking lot, please use Tennoji Park’s underground parking lot. See here for the ticket rates at Tennoji Park’s underground parking lot. Vehicles are generally not allowed to drive up to the museum, however, if you a person with a disability or are a senior citizen who has difficulty walking and are unable to reach the museum without the use of a taxi, then it is possible for you to arrive by taxi. Before arriving, please contact us with your name, arrival time, and the name of the taxi company that you are using. *If a taxi is necessary when leaving the museum, then please notify a member of the museum staff or one of the guards.